ABSTRACT: Foraminifera are abundant and diverse in the Neogene sedimentary units of south-central Chile (34–43ºS), but their age and depositional paleoenvironment have been points of contention for decades. The marine strata most often referred to the Navidad Formation have been a focal point of study in the region by geoscientists in academia as well as the Chilean oil industry. Most of the foraminiferal assemblages documented in this study are from three sedimentary basins isolated from each other by more than 400km. From north to south, they are (1) the Navidad Formation in the vicinity of the name-bearing town located southwest of Santiago, (2) the Ranquil Formation on the Arauco Peninsula southeast of Concepcíon, and (3) the Lacui Formation on and near Chiloé Island. Also included in this study are two assemblages from deposits of uncertain affinity in San Sebastián (northeast of the Navidad area and just north of San Antonio), and one from the Santo Domingo Formation in the vicinity of Valdivia (about midway between Arauco and Chiloé Island). The 27 localities reported in this study span nearly 1000km of the south-central Chilean margin. Most of the samples are siltstones from coastal bluffs and wave-cut platforms in which bedding is nearly horizontal, but often massive or indistinct. Regional workers have disagreed on which subepochs these units represent. Suggested ages based on macro- and microfossils have ranged from Late Oligocene to Early Pliocene. 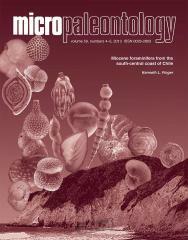 The planktic foraminifera identified in this study suggest that most, if not all, are Miocene. Excluding the two San Sebastián assemblages, which are slightly younger, one assemblage devoid of planktic foraminifera, and three with only long-ranging planktic foraminifera, all of the remaining 21 concurrent ranges begin or end in the Early Miocene. Nineteen of those ranges are restricted to that subepoch and two range into the early Middle Miocene. Seventeen of 18 localities had an 87Sr/86Sr age ranging into or within the Early Miocene. The exception yielded an isotopic age within the latest Oligocene. The majority of the analytical data presented in this report suggest that most of the assemblages are of late Early Miocene (Burdigalian) age. The most abundant macrofossils in the Navidad, Ranquil, Lacui, and Santo Domingo formations (collectively and informally referred to in this study as the Navidad group) are gastropods typical of neritic habitats, but specimens tend to be widely scattered in the outcrops and they are associated with mixed-depth assemblages of foraminifera. I therefore concluded that there had been significant downslope displacement. The upper depth limits of the deepest-dwelling benthic foraminifera in each assemblage indicate that final deposition occurred at bathyal depths, well below the neritic zone. All of the 358 taxa (336 benthics + 22 planktics) identified in this study are presented systematically and illustrated. New species described are Astacolus novambiguus, Cornuspira libella, Cristellariopsis petersonae, Fissurina ambicarinata, Globocassidulina chileensis, Karreriella biglobata, Percultazonaria encinasi, Percultazonaria obliquispinata, Pseudolingulina nielseni, and Pseudononion ranquilensis. In addition, I propose one new (substitute) name, Lenticulina neopolita, to resolve a synonymy. The presence of Neogene cosmopolitan deep-water benthic foraminifera in all of the assemblages supports the hypothesis that deep water masses derived from the Antarctic Circumpolar Current have enabled many Neogene deep-water foraminifera to disperse widely in the global ocean. This compendium is a useful guide to identification of Neogene foraminifera in subtropical/temperate regions in and beyond south-central Chile, and it also provides a regional dataset that can be incorporated into future studies on benthic foraminiferal biostratigraphy and biogeography.